Lost Luggage Productions is thrilled to announce two great shows by our performers and directors at The Edinburgh Fringe 2017. ‘Jaw-dropping entertainment from a modern day wizard’ ★★★★★ Telegraph. 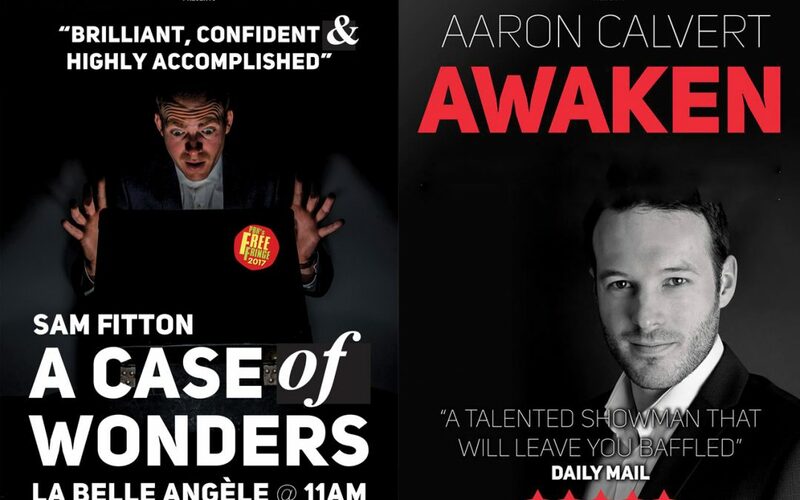 Following a sensational 2016 sell- out debut, Aaron Calvert returns with more astounding mind reading and fascinating hypnotic feats in his brand- new show Awaken. ‘A talented showman that will leave you baffled’ ★★★★★ Daily Mail. Aaron’s mastery in mind control, hypnosis and psychology, combined with his background as a doctor makes this show a face- paced, edge-of-your-seat experience. An afternoon of mind reading, hypnosis and magic. It’s time to Awaken your hidden powers. A theatrical twist on the traditional magic show, A Case of Wonders combines magic, comedy and special effects in its Edinburgh Fringe Debut that promises to be something out of the ordinary. After missing his train Sam is left stranded on a station platform when all matter of strange goings on occur. With razor sharp comedy, award winning magic and audience participation, Sam Fitton’s A Case of Wonders is certain to be full of surprises.